I think you can see from the title what this blog post is about! It's about products I finished. "Empties October 2017" sounded really boring to me, so I came up with "Finished, Used Up and Empty"! The empties are actually not only from October, but also from about a month before. Let start! 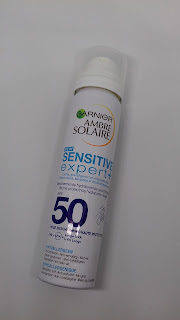 First, I ran out of my Garnier Sensitive Expert+ SPF 50 (click!). As I expected I ran out pretty quick. The first 2-3 weeks I used it daily, after that I used it after a workout session at the gym (about 3 times a week). I finished it after 2 months of use (not daily). 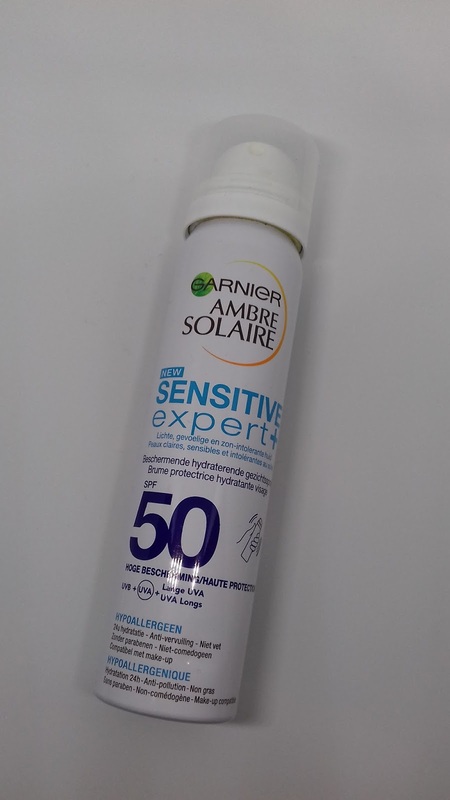 It's a sunscreen that does it's job. If I had used it daily, I think I'd run out in 1-1,5 month. When applying, there's a lot of product that goes to waste, but that's often the case with sprays. I finished this product in about two months. Would I repurchase? I don't think I will. I prefer sunscreen for my face in gel or cream formula. Next: my lovely Le Volume de Chanel (click!). The beautiful mascara of Chanel. It passed the six month mark and it also starts to smell funky, so it's time to toss it. Would I repurchase? No. I like the mascara, but there are other mascaras out there that I want to try and there are also other mascaras out there that give me volume and separation. My lashes tend to clump up if I run the brush through my lashes several times, so I have to keep in mind not to run the brush through my lashes too much. For instance:with my Lancôme Hypnôse Drama (click!) I can run the brush through my lashes as much as I want and the lashes are still pretty good separated. 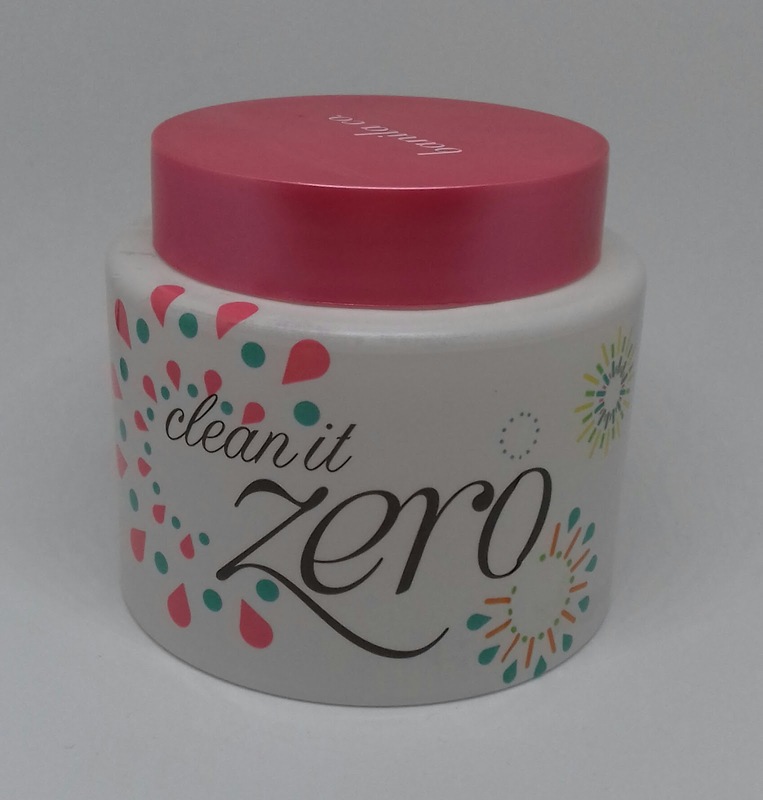 I also finished my beloved Banila Co. Clean It Zero cleansing balm (click!). It took me about a year to finish it, I think? It was the 180 ml version. It just removes my makeup like a dream. It melts of everything and when I say everything, I do mean everything! Super long-lasting eyeliners? Yes. Long-lasting liquid lipsticks? Yes. It's great stuff and I really love it. The scent is lovely, the formulation is lovely. I love everything about this stuff! Would I repurchase? Hell yass (luckily I have one back-up :D)! 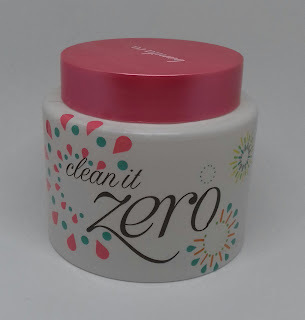 The only thing about this product is that the packaging is huge, but if you cant to take it with you traveling somewhere, just scoop some over in a smaller jar and the problem is solved. Also skincare: Lush Fresh Farmacy (click!). I was an okay cleanser for in the shower. It didn't do very much for my pores or impurities, but for those with low maintenance skin, this is a good cleanser. I would not repurchase. 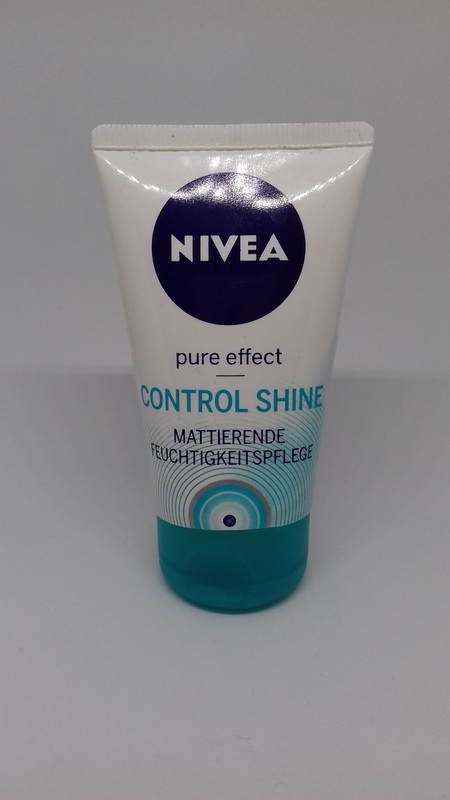 This is one that has been lying around for a while, there was a tiny bit left and I even cut open the packaging, but I never felt the need to really finish it: the Nivea Pure Effect Control Shine Mattifying Moisturizer. I'm tossing this one, I think I used it in my teens....? It was mattifying, for about an hour or maybe even two hours, but after that my skin still got greasy and all. 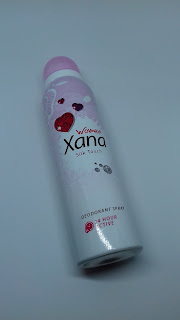 The product smells good, the scent just reminds me of Nivea creams, but a bit younger (if that even makes sense to you). Packaging is cute. Like the fact that it don't have to put my finger in it to get some product. It didn't do miracles for my skin, but there is a SPF in it, not sure how much, packaging doesn't say. It's a good basic moisturizer with some mattifying effect for the first hour(s). I also finished my Lush Tea Tree Water. 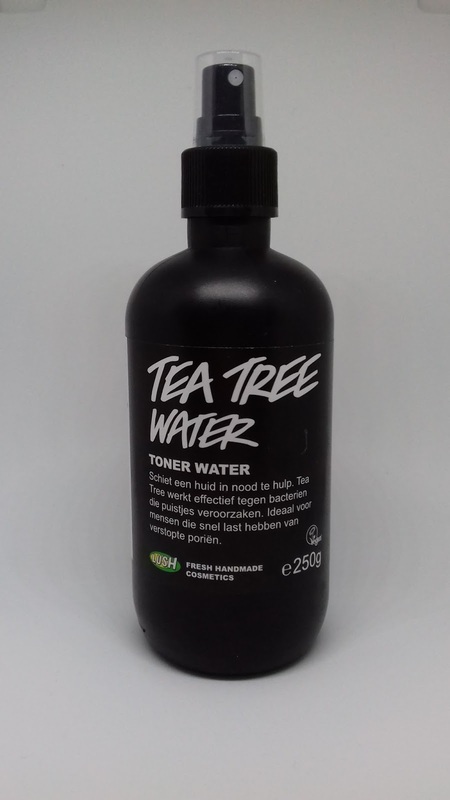 Good toner. I apply it before I put on my moisturizer or exfoliant and after I cleansed my face. Sometimes I use it as an extra step in my cleansing routine, but I use toner mainly for pre-moisturizing/exfoliating. I liked this, the scent was very fresh, the toner was very refreshing. It didn't do very much for "calming" my skin (fighting redness), I still had some red spots on my skin. But I actually never expect very much of toners, I like the extra refreshing feeling and how it helps moisturizing my skin. Would I repurchase? No. I have to say this is my second bottle (got it as a gift) and I used every drop of it. I like the whole idea behind Lush and that their products are so natural. But I, personally, would not repurchase. Not because I don't like it, but because there are so much more toners out that I want to try out! When given as a gift I would use it with joy though. After a long while I finished my Maybelline EverFresh Concealer. I had this one for a loooong time and I only finished it on October 25th. 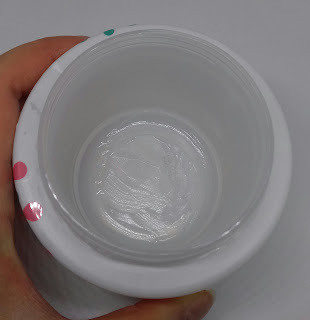 It's 100% empty: I even removed the stopper and scooped the last bit out with a small brush. This concealer was too cool for me, so I added a few drops of food coloring to it to make it more yellow, but I went a bit overboard. It became a way too yellow concealer, but luckily my foundation is a bit too pink, so I mixed them together to get the perfect color. 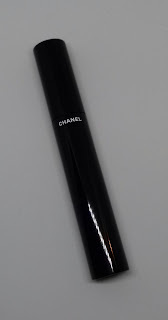 The foundation I'm talking about is the Chanel Perfection Lumière Velvet. Now this concealer is empty I have to find an other way to correct the color. Would I repurchase this? No, because there are a lot of concealers out there that I want to try out! 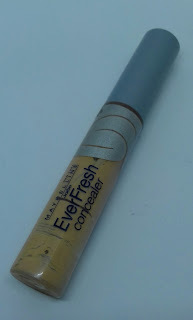 It was a good concealer, the coverage was medium, very buildable, but too bad it was not the right color for me. Next in line: deodorant. It's nothing special. I use deodorant before and after a workout. 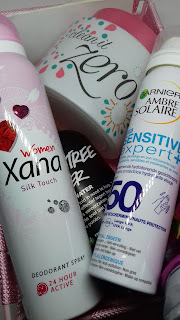 I don't really use deodorant on daily basis, simply because I forget to apply some in the morning and because I don't really sweat that much during the day in the colder seasons. When it is hot outside, deodorants are not enough for me or my armpits. In that case I like to use the more heavy stuff like the c.d.6+ anti perspirant (click!). 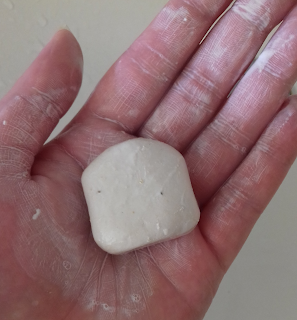 This barely happens, but I finished a hair product that's not for use in the shower. 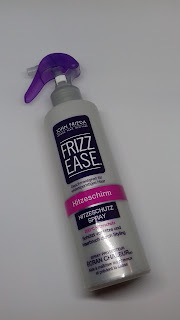 It's the John Frieda Frizz Ease Heat Protecting Spray. I got it when I was in Germany about a year ago. So this spray lasted me about a year. I spray it on my hair before I blow dry my hair. I wash my hair 2-3 time a week. I don't know what results there are to measure with heat protecting spray, but my hair is not dead after all the blow drying, so I guess it works! Would I repurchase? If I'd ever run out of all my heat protectants, sure, why not? Though I don't mind trying other sprays. 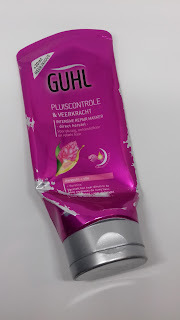 Speaking of hair products, I also finished an intense repair mask, it's by Guhl. What comes to mind when I read "intense repair mask" is super soft and shiny hair. Does this stuff leave my hair super soft and shiny? Not really, not as soft and shiny as it could be. I'll rate this as an basic conditioner. Would I repurchase? No, because this didn't leave me wowed and also because there are so much more products out there that I'd like to try. I do have to say, most shampoos, conditioners and masks I use aren't doing very much for my hair. Next item is a showergel. It's by Palmolive. The Vanilla Pleasure Body Butter Wash. It's a pretty thick shower cream with a nice vanilla-y scent. It does what a shower gel should do. 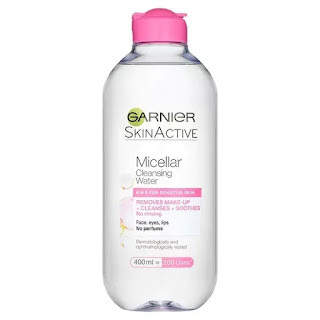 The last thing I finished this month is the Garnier Skin Naturals Micellar Water. By now you probably know this product, because it was sooooo hyped one or two years ago. I am not blown away by this product, but I have a few bottles of this one in my back up drawer, so I'll finish those. I have used better micellar waters and definitely don't think this is best one. It cannot remove my Rimmel Scandaleyes Waterproof Kohl Kajal eyeliner or liquid lipstick. 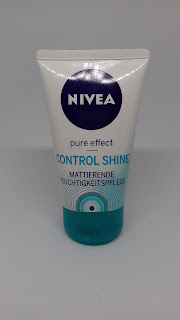 So I'm definitely not a fan and I really do think that this is one of the most overhyped products (I've used on by Nivea and that one does an excellent job removing all my makeup). I use this micellar water as a second step in my makeup removing routine; after I used Banila Co Clean It Zero cleansing balm to melt off all my makeup, I use the micellar water on a cotton pad to remove the cleansing balm off my face before I hop under the shower. Would I repurchase? Nope.